Why Pick and Choose When You Can Have it All? Members of our exclusive All Access embroidery club receive everything we release at the best value possible. Our members experience the very best in embroidery designs, quilting in the hoop, unique project collections, and embroidery education that the industry has to offer. Each month, members receive a beautiful full color magazine containing fully illustrated tutorials for all design collections released that month, as well as industry insight, an exclusive “Coming Soon” section, deals on past collections, and much more. Through the designs themselves and the magazine, All Access provides everything you need to enjoy your passion. What are you waiting for? Join All Access today! Featuring an incredible variety of designs and machine embroidery techniques including appliqué, quilting, printed fabric, cutwork, and more. Our most comprehensive collections which usually include hundreds of designs, a variety of projects, cutting edge techniques, in-depth tutorials, and tips from the pros. Our renowned line of in-the-hoop projects which can be completed in 45-90 minutes each! We release these sets as weekly downloads to the general public, but All Access members receive them first, on their CD at the beginning of the month. 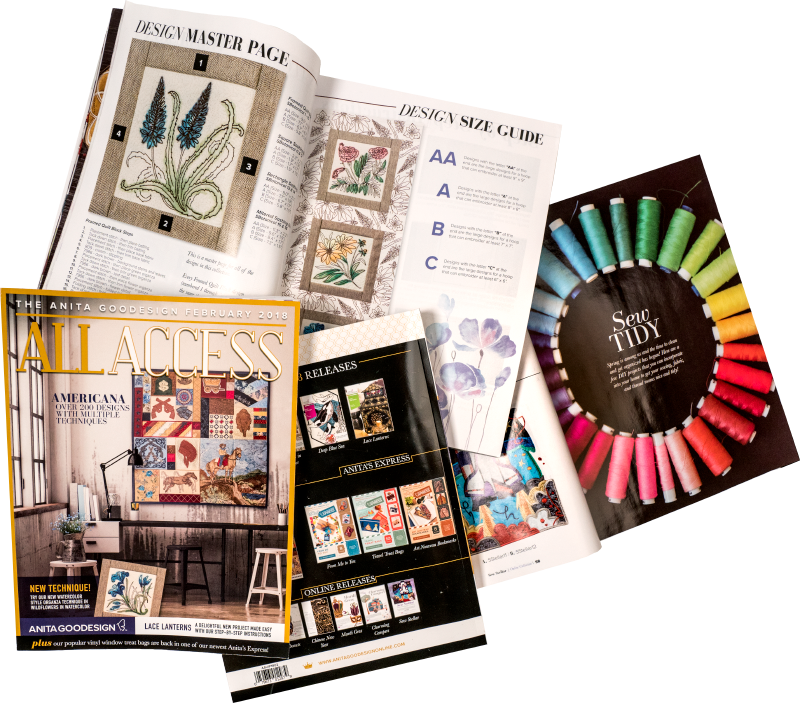 Each month’s collections are delivered in a beautiful FULL-COLOR MAGAZINE filled with all of the tutorials and designs for that month! Each issue includes exclusive and exciting fresh content, sneak peeks of upcoming releases, and tips and tricks that we use every day on our work table. There Are Two Ways to Join All Access—Which is Right For You? Want to get the best overall value for your money? If you want to build up your embroidery design library, sign up for annual All Access and receive a $1,400 gift card to shop our site! We have over 1,000 collections—something for everyone. The Ready, Set, Sew! kit includes everything you need to know to get started using our designs. We included a variety of releases showcasing our many techniques and releases, such as The Stitchin in the Kitchen workshop, the sold out Express Handstitched Christmas Pillows, and sew much more. Want a more flexible way to join? Cancel or pause your membership anytime; just be sure to call us by the 8th of the preceding month to let us know. Simply $99 each month you choose to remain in the club. You receive the same issue and collections each month, no matter how you join. Either way you join, you'll SAVE 84% on retail value! You can sign up for All Access club at one of our events, through your local dealer, or right here on our site. To enroll now in the annual club, simply click above; after you check out, a representative will reach out to you to finalize your enrollment and send your $1400 gift card! If you would like more information on the Month-to-Month club, or have any questions about All Access, please reach out to our Customer Experience team at 704-708-9277 ext. 1, or by email at customerexperience@anita-goodesign.com. Whichever way you join, get access to exclusive discounts, club member appreciation days, sneak peeks, and more, just for being a member. You literally HAVE IT ALL!